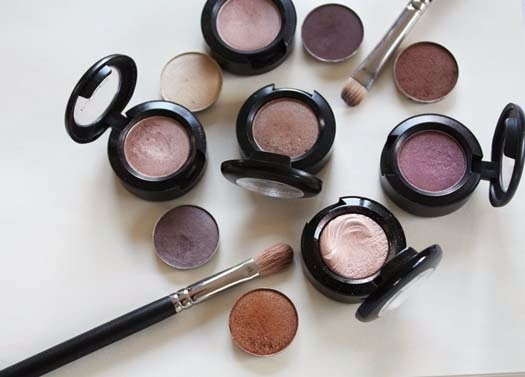 It's no secret that I love eyeshadow so naturally I have tried eyeshadow from a few brands in my time. I always come back to Mac's eyeshadows though. They really beat out everyone else for pigmentation, shade range, longevity and of course being so easy to blend. 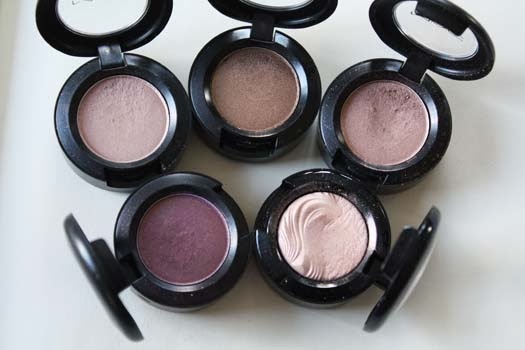 There's been a few requests to blog my Mac eyeshadow collection, lipstick is coming soon. I have a mix of neutral eyeshadows in pans and containers, I'm in the process of building a Mac palette but more on that another time. Here's what colours are in my collection.. These are all my Mac eyeshadows. I also use the Mac 217 and 239 brushes to apply these. Amber Lights A peachy-brown with shimmer. This shade is a bit frightening in the pan and even on its own but it works well with All That Glitters and really makes it appear more vibrant. A Natural Flirt, limited edition This shade was part of a Christmas collection last year. It is similar to All That Glitters but is more champagne toned. These colours look perfect on their own or dressed up with loose pigments and glitter if you're going for a more dramatic eye look. All That Glitters This colour is described as a beige with gold-pearl. This colour is easily my most used eyeshadow and probably will end up being the first one that gets completely used up. It's one of those colours you can just swipe over the lid, do a little bit of blending with and be done. If you've not seen this colour before go to a Mac counter, swatch it and be prepared to add it to your basket. Bronze If you're familiar with the Eclair paint pot then this is a similar shade. Bronze has more gold and shimmer to it than the cream version though. It looks stunning on brown eyes in particular and works well with a subtle smoky eye. Handwritten This matte brown is both the only matte eyeshadow I own and probably my least used. I use this on my eyebrows usually but since buying a brow pencil I haven't used it very much. If you've got darker brows this may be a better powder to use than the likes of Charcoal Brown or Omega. Naked Lunch A very neutral, pale pink with a hint of shimmer. If you've ever watched Tanya Burr's videos then you'll be familiar with this one. Like All That Glitters this is another shade that can be swept across the lid by itself. This also works nicely as a base alongside other shades. Nylon If you're a fan of Bootycall from the Naked 2 palette but find that just a bit too shimmery then you will like Nylon. It's perfect as both an inner corner and browbone highlight without looking extremely glittery. Satin Taupe The cult classic-and surprisingly another shade I don't use very often. This is the perfect Autumn-Winter shade though and I will definitely be using it more next year. Trax My favourite Autumn shade. This burgundy-plum is shot through with very fine gold glitter so it has a touch of sparkle too. It works well alongside a vampy lip, winged liner and lashings of mascara. Woodwinked If you like gold eyeshadow but don't want the foiled, metallic effect then you will love Woodwinked. A warmer, antique gold that veers more on the neutral side of things. This is another shade that complements red lips well. If you do want to amp up the shimmer you can always add loose glitter over the top. Definitely go give Mac's eyeshadows a look. They have such a fantastic range.